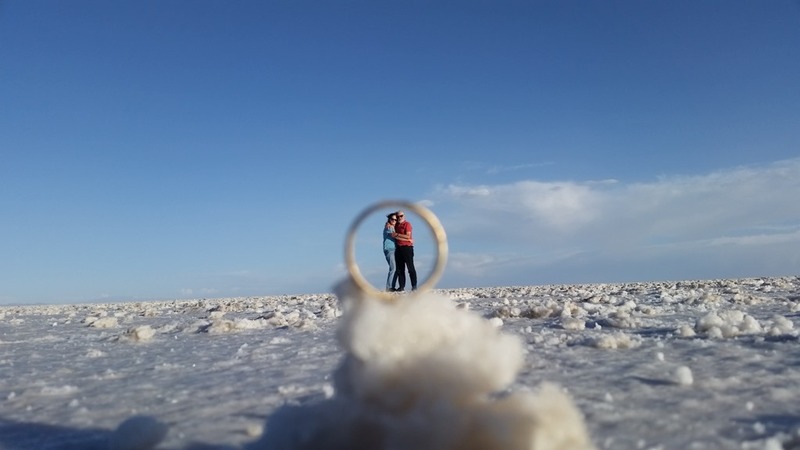 One of the reasons why we were going to Boliva was to visit the Uyuni Salt Flats. 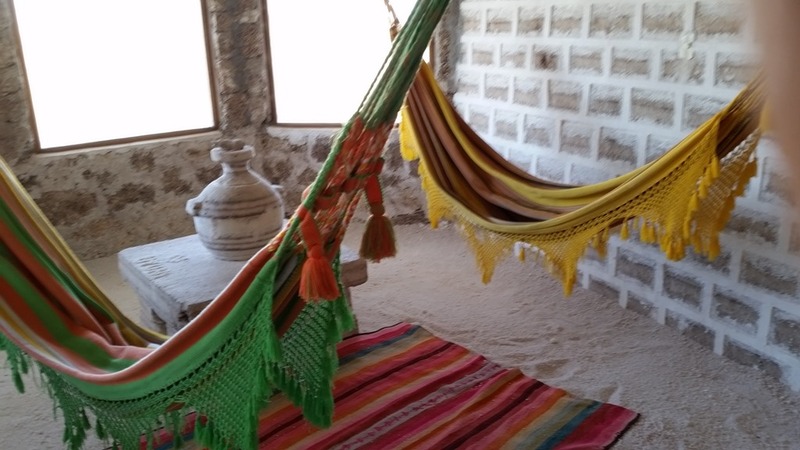 We arrived there from a flight from La Paz to Uyuni. 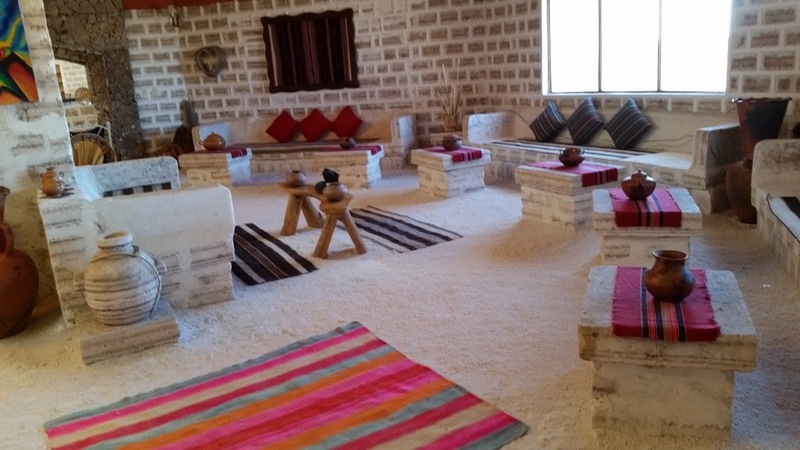 And since we figured that this would be the only time we would visit the area, we wanted to stay in a “salt hotel”. 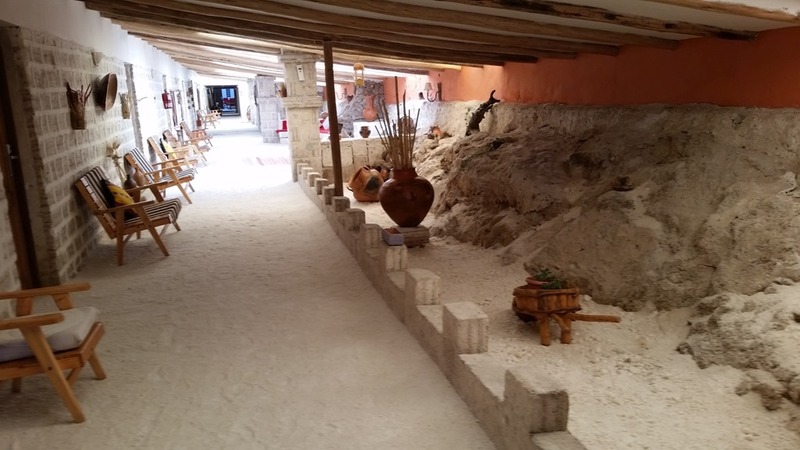 What is a salt hotel? It is a place that is primarily built out of salt. Our hotel was the Luna Salada Hotel. 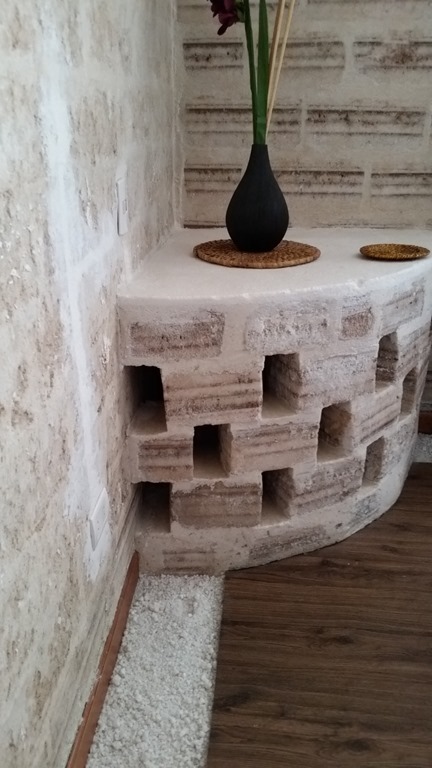 Since we made our reservations late (only 8 months in advance…yes, the hotel gets booked early) we were not able to book one of the rooms that was actually constructed totally of salt—all salt furniture and salt pebble floors. 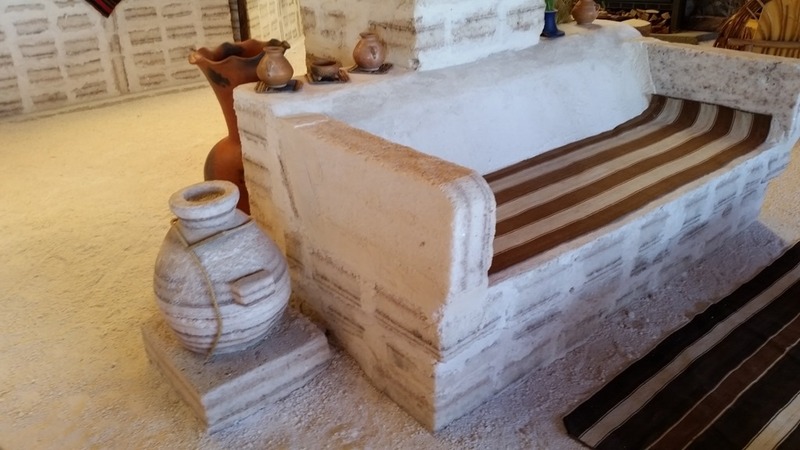 But we still got a room that had some salt construction…. 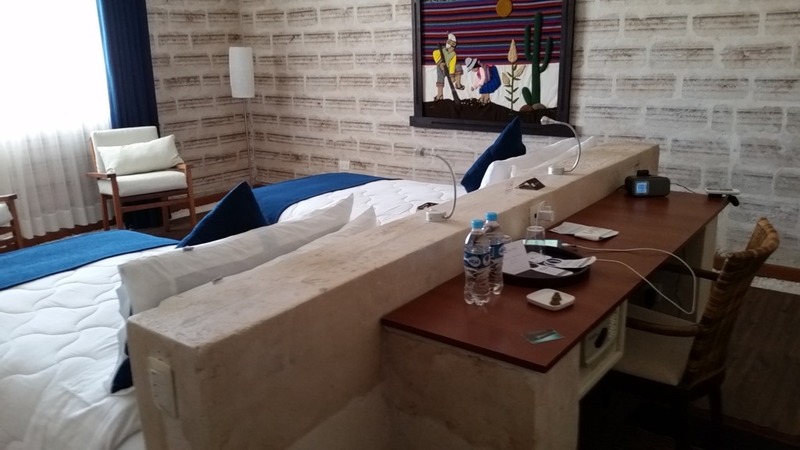 our walls, our bed platforms, a decorative table and the floors borders. 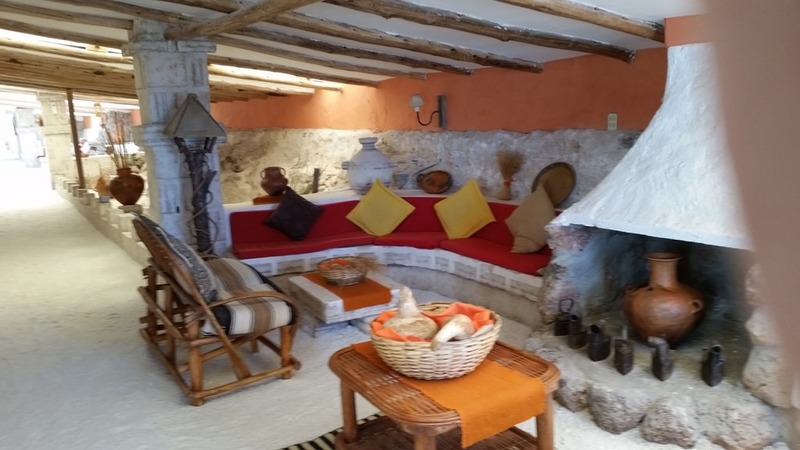 But unlike the original salt rooms, our floor and the frames for the room’s two chairs are actually made of wood (which are actually, more comfortable on which to walk and to sit). Not to speak of them being newer and larger. And yes, when we say things are constructed of salt, they really are. Joyce, like probably everyone else who stayed there, actually licked the walls to verify. I wonder how many germs she picked up from that! The hotel itself is amazing. 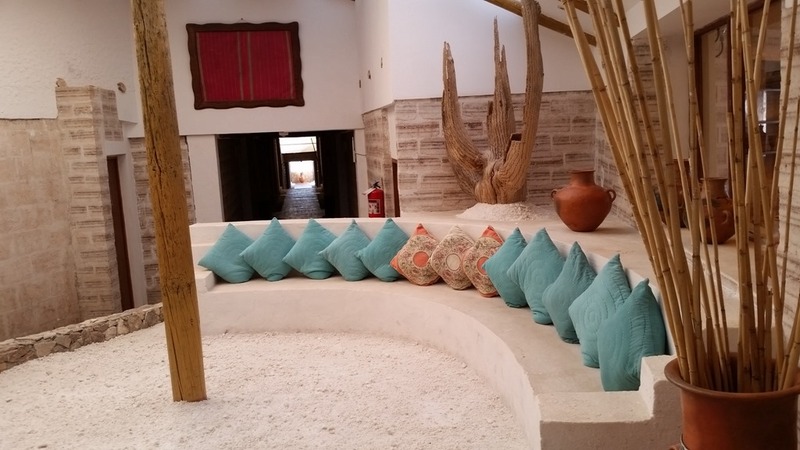 The walls, the front desk and the common area furniture are all constructed of beautifully carved and textured salt blocks; the floors consist almost totally of salt pebbles; the furniture in the extensive and dramatic common areas are almost all made of the same type of carved salt blocks and slabs as the walls (and have colorful cushions to soften both the effect and the seats). 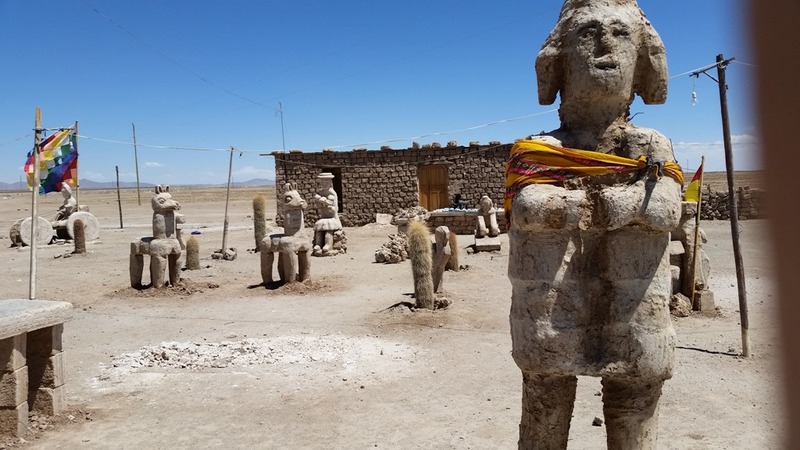 The accents, meanwhile, consist largely of indigenous natural volcanic stone, rustic-looking cactus trunks and pottery and colorful Bolivian rugs, paintings, weaving and tapestries. The effect is magnified by the long salt hallways that are lined, virtually end-to-end with large, open seating areas and white plaster ceilings with natural wood beams. Incredible! And to add to the mystique, we were virtually the only Westerners in entire, large hotel. Virtually every other visitor was Japanese. The Japanese, as one of them told us, view the salt flats and salt hotel as spiritual. 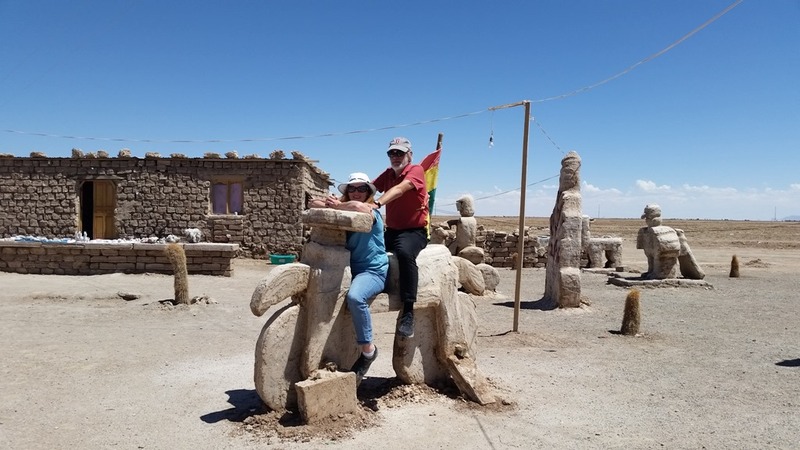 One couple with whom we spoke had La Paz (as a staging area for Uyuni), Uyuni and Lima as their only South American stops in a trip that also included Mexico City and Los Angeles. Our room, besides being strikingly pretty, was comfortable, especially if you like firm beds (which we do) and well-appointed (including with the luxury of plentiful, well-placed electrical outlets). Without a car, you are pretty much a captive audience for food, so we had all meals at the hotel. To say that it is expensive for what you get is an understatement. But, again, we really didn’t have many options. Although we were only there for one night, we had 2 lunches, 1 dinner and breakfast. Lunch started out miserably (a tasteless, overcooked hamburger quesa (cheeseburger) and paper-thin, overcooked llama medallions. Although they said this was the only way they could do the burger, they were able to do the llama medium rare. These medallions were not only cooked as promised, but much thicker and very tasty. As was the accompaniment of an undressed salad of quinoa, hearts of palm, corn and broccoli. Fries corn with both meals and we shared a half bottle of adequate Bolivian Campos de Solana 2012 Cab/Merlot Reserva. Dinner consisted of Argentina-style sirloin for Tom (more medium than the rare he requested, but acceptable, and the reasonably tasty grilled chicken (the safest option for Joyce since we are both skeptical of the local seafood). We had with these the nice Campos de Solona 2011 Cab/Merlot/Malbec Reserva. For our second and final lunch, we decided to play it safe, and light, with Caesar Salads and glasses of the generic Campos de Solona white. Oh well, we were not there for the food, but for the salt flats. 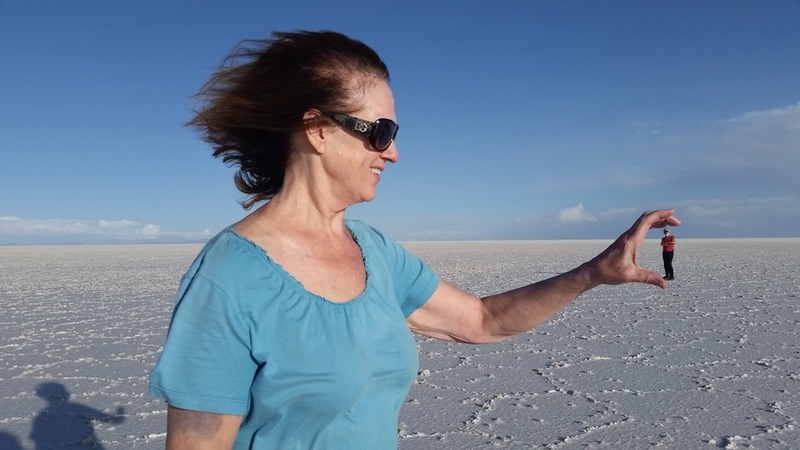 Although we viewed our stay at the salt hotel as an integral part of our total Uyuni experience, the salt flats themselves were the main show. 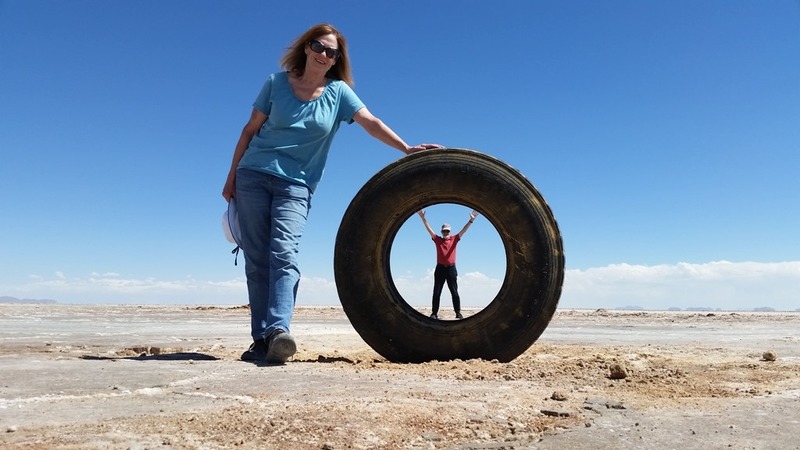 So, after a brief lunch, we were off on a hotel-arranged afternoon and evening tour to explore the salt flats, the salt lake and the salt mirror (where the sky seamlessly blends into the ground). This is truly a magical place as you will see from the many pictures in this blog. The salt flats themselves are mile upon mile upon mile of flat bleached white dessert interspersed with scrub brush. There are also occasional highly eroded, fossilized, sedimentary rock outcroppings and unexpectedly, many buried rocks whose exposed tops are covered with colorful green moss and sometimes, clusters of pretty, tiny white flowers. A series of cool water, bubbling mineral (primarily sodium, sulphur, lithium and hydrogen) pools that originated as hot water but cooled after flowing miles through underground lava tubes. 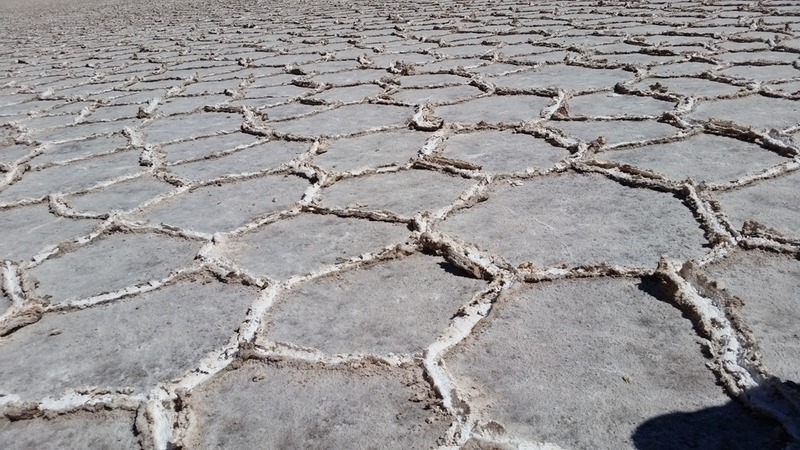 A previously flooded salt plane that, as the water evaporated, the salt cracks into multi-sided polygons. The salt on the borders between those segments on which the water has totally evaporated, can percolate several inches above the ground, and can be easily harvested. The parts of the plane in which some water remains, continues to show the polygons, but the surface remains clear. Then, occasionally, there are some polygons the way through, exposing pools of clear blue water, lined with salt crystals, as far down as the eye can see. 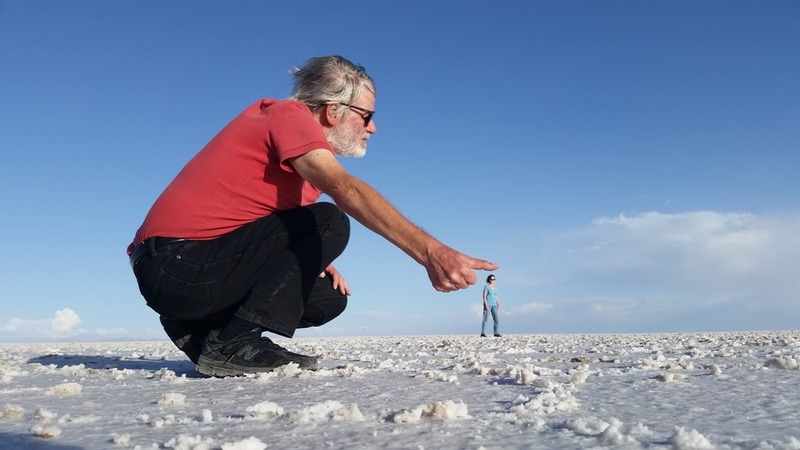 We learned from our guide, however, that these are not discrete pools but tiny windows into a huge, 1,200 square kilometer lake: a lake from which 25,000 tons of salt are harvested each year and in which an estimated 146 million tons remain. 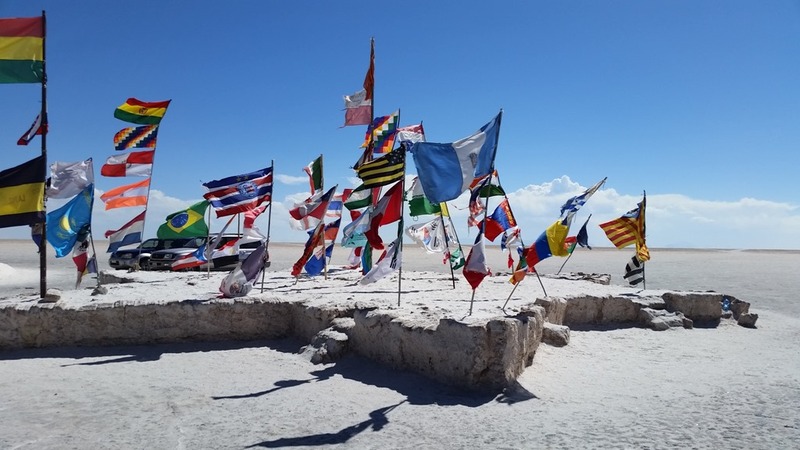 Dacar salt monument, commemorating the vehicle extreme race in which vehicles for Bolivia and neighboring countries compete and Playa Blanca where flags of all nations for which tourists wish to hang are displayed in a show of international peace and cooperation. Special effects, whereas the endlessly flat, empty landscape allows you to create optical illusions by eliminating perceptions of depth. By having one person or object marginally closer to the camera than another, it can allow one to look significantly larger than the other. This allows all typed of effects, such as the perception of one person standing in another’s hand, one person (in this case Joyce) under Tom’s giant thumb, or a very happily married couple fitting inside their own wedding ring. There is even a staged prop in which allow very different size people to be rolling a truck tire. Wildlife, including a grand total of one llama and one alpaca. 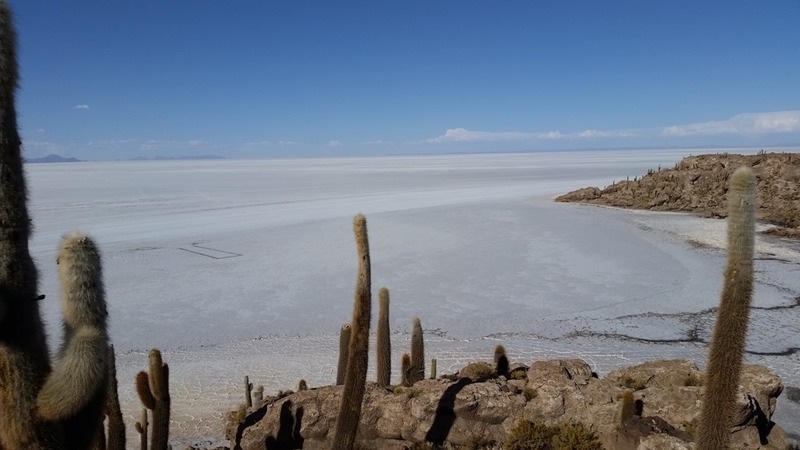 This salt dessert, which is the country’s greatest tourist attraction, is, not incidentally, also the home to the country’s greatest potential economic bonanza. Lithium, as you probably know, the single most important ingredient in lithium-ion batteries, which are, pound-for-pound, the most efficient electricity storage media in the world. They are critical components of products including laptop computers, smart phones, electric and hybrid cars and renewable energy systems. And, as discussed above, Bolivia’s reserves of this mineral are thought to account for 50 to 70 percent. 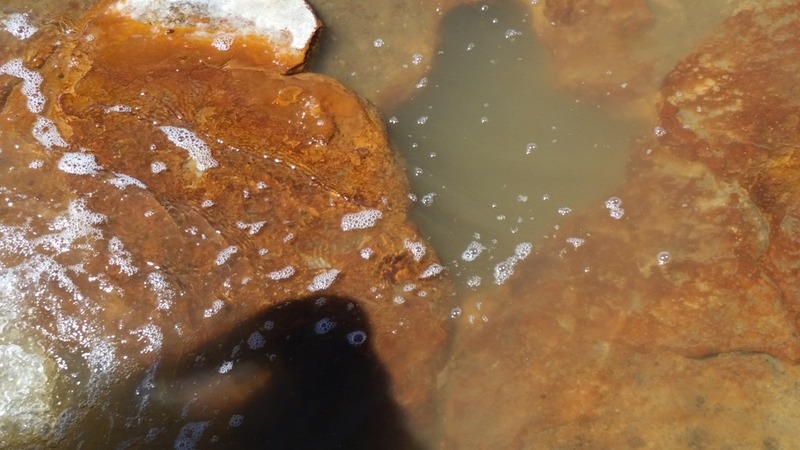 It hopes to develop not just an extraction business around this resource, but a broad range of high-value downstream businesses including lithium ion battery and laptop computer manufacturing operations around it? But, will it be able to truly exploit it lithium reserves without jeopardizing its current tourism cash cow? Can it really even hyper-accelerate its current very basic, very limited manufacturing operations into high-value, technology-based manufacturing. 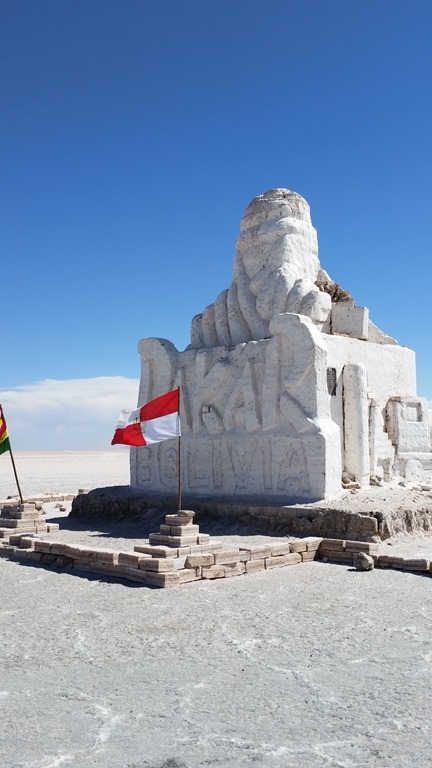 Will foreign companies invest capital and transfer technology to a country with Bolivia’s nationalization history? Or will lithium ion be superseded by another technology before Bolivia is able to able to capitalize? We shall see. But there is plenty of time to ponder such imponderables. With daylight waning, we have a date with a sunset. 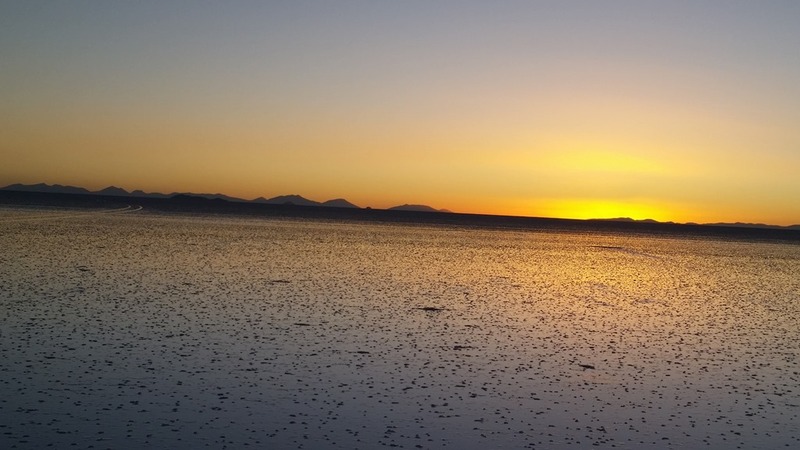 Our sunset viewing destination, the “Salt Mirror” a thin layer of water that lies atop the flat salt surface to produce effects including reflections of distant mountains and of the sunset and a perception that the ground and the sky merge. But, while the day’s sunset was nice, it was far from one of the more glorious we had seen. And since our camera found a new home in Buenos Aires (where it was stolen), we had to rely on our cell which lacks many of the capabilities and on which we lack sufficient expertise. We suffered similar limitations in our attempts to capture the rise of the night’s full moon. Then, by the time it had turned dark, we had reached our final viewing destination of the day: a dark spot from which we would spend some time exploring and pondering the southern constellations though some of the clearest skies in the world. (Although we were recently in the absolute clearest skies of Antarctica, we were there in mid-summer, when it never really got dark.) It was, nonetheless, pretty and our driver’s GPS-based astronomy application did allow us to pick out and imagine some of the constellations. 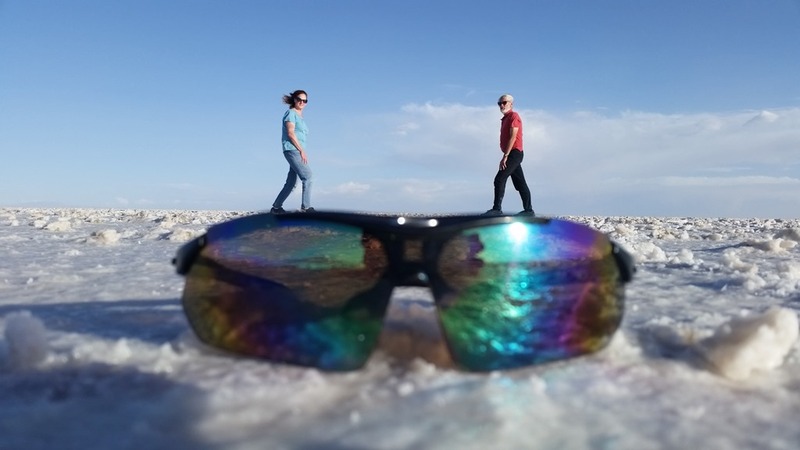 Our overall assessment: the salt flats are indeed an amazing spectacle. And in our view, absolutely the number one attraction we have seen in Bolivia. But to our eyes, it is hardly in the same league as other South American jewels such as Machu Picchu, Galapagos, the Amazon Basin or, if one is to stretch a comparison, with Rio’s Carnival. This being said, however, we would probably view it as comparable to Iguassu Falls and some of most scenic areas of Patagonia. Amazing, if not necessarily perception altering. 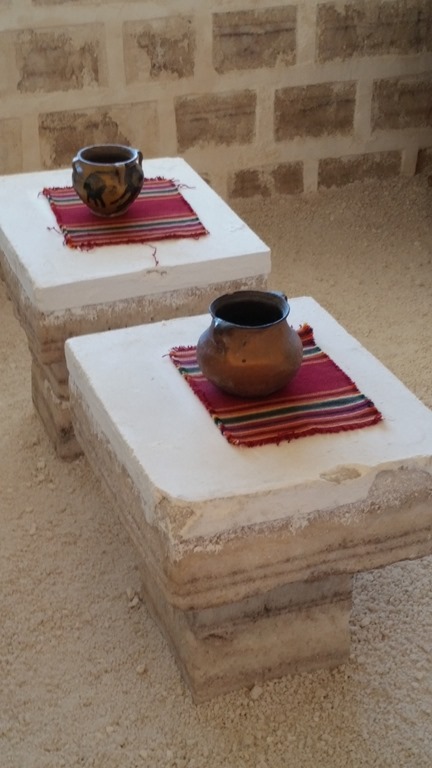 The highlights for us were, the salt hotel, the perceptual tricks associated with the loss of depth perception, the polygon-shaped salt plates and the views of the salt crystals and the vast underground lake through the fallen or dissolved plates. However, in hind sight, we probably would have arranged some tours independently of the hotel. In talking to others, it wasn’t that hard to do and it gave you more flexibility.